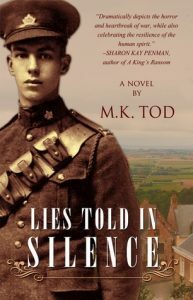 My guest today on Triclinium is MK Tod, Canadian author of the newly released Time and Regret. Mary began writing while living as an expat in Hong Kong. What started as an interest in her grandparents’ lives turned into a full-time occupation writing historical fiction. Her novel Unravelled was awarded Indie Editor’s Choice by the Historical Novel Society. 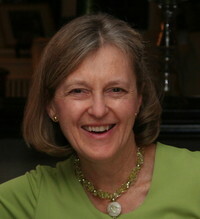 In addition to writing historical novels, she blogs about reading and writing historical fiction at A Writer of History. 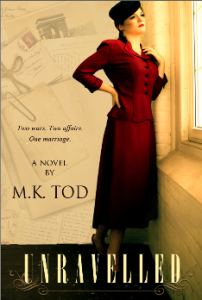 You can connect with Mary on Twitter @MKTodAuthor or Facebook. Mary’s previous novels, Unravelled and Lies Told in Silence, were written in third person. 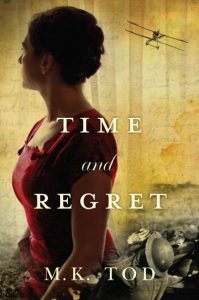 Mary tells us why she changed perspective in her third novel, Time and Regret, which is a mixture of mystery, history and romance. For readers, a first person narrator creates a feeling of intimacy that doesn’t exist with a third person narrator—the he or she type of narrator. It allows the author to develop authenticity and credibility by explaining the characters motives, actions, thoughts and feelings in a very natural manner. And it allows for a more distinctive voice to shine through. Straight away you have a character with a strong voice and ironic attitude. We know she’s had a painful romance; we know she’s been in an exotic, foreign land. There’s something enticing about the notion of a man who has already been buried and an adventure that began in Rome, and the word scolding suggests the narrator isn’t the slightest bit fussed about being scolded. The paragraph wouldn’t have the same impact in third person. “Divorce is a process, not an event. It takes months to unfold, a barrage of emotional ups and downs as denial is replaced by grief, grief by anger, and anger gradually eases into acceptance. To complete the process, Jim’s possessions had to go, so every Sunday since early February, I had tackled a different room in the house. What am I trying to convey? I want readers to know the pain my character, Grace Hansen, has experienced and build an immediate connection as a result. I hope they will see her as a strong person, since she’s moved on to acceptance and is clearing her ex-husband’s things away, and a pragmatic, disciplined individual since she’s tackling one room every week. But I also hope readers will see each item she clears—the trout, the baseball, the racquet and maps—and place themselves in Grace’s home with her and I hope they will understand that she’s begun to be optimistic about life after Jim. But here’s the problem: a first person narrator has to be ‘on stage’ in every scene and, as Elizabeth George goes on to say, “the reader can only see, hear and know what the narrator sees, hears and knows.” There’s no omniscient storyteller giving an outside view of the history behind the characters or the feelings of other people involved in each scene. How did it feel as an author to write in first person? Actually, I found it liberating. Very liberating. I could give voice to emotions and thoughts more freely. And I found it more natural than third person likely because this is the way we think and talk as individuals. But I did cheat a bit and that’s because Time and Regret has two timelines, one taking place in the early 1990s and the other—the story of Grace’s grandfather—taking place during World War One. For that second timeline, I created Martin Devlin and wrote most of his story in third person. Looking back, I’m happy with the choices made and I suspect I will create another first person narrative in the future. Your thoughts for a giveaway! Many thanks, Mary, for this insightful post. I personally prefer close third person but may venture into the world of ‘I’ in my next novel! Time and Regret is available on Amazon US, Amazon Canada and Amazon UK now. Many thanks for hosting me on Triclinium, Elisabeth – and for the long-distance friendship we’ve developed. And hello to your readers from Toronto, Canada. I also have one novel written in first person and it was exactly that for me as well: liberating and natural. I felt I had never delved so deeply into a character. I remember vowing I would never write in 3rd again. (But I have.) It seems to be an acquired taste among readers: a love or hate situation! So love first person narrative and am using it in my latest novel The Woman in the Shadows to be published 17th May 2016. You can go deep but yes there are problems with what happens off her stage. Thanks for dropping by Reb and Carol – I’ve only used first person in a short story to test the waters. Somehow I always feel more at home with close third person which also raises the problem of ‘off stage’ action. Maybe I’ll have to try the alternating points of view as Mary has done in Time and Regret in my next novel! Time & Regret sounds great. I love the immediacy of first person but the limitations proved tricky for my novel, so I wrote it in close third, but in present tense 1898. It’s not the norm and the challenges of head-hopping and info dumping was constant, the history is involved. But as a children’s novel it was the only way to give black, white and Asians a voice, and explain simply all sides of complex government and racial issues to modern Aussie kids. I have written a single character in the first person within my book, Search for the Light, otherwise it’s in the third person. Why? Because she wrote herself. It just happened and it felt natural. As it progressed I realised how traumatised she was. She would not speak to others until she gained friendship and confidence. Like Rosemary, I am experimenting with my main character in the first person and a secondary viewpoint in third person, fairly deep third. I think it should work, but don’t know how readers will feel about this. Do you have any views? I like first person most but I like third person also. I love a lot of authors. I guess my favorite would have to be Marie James. I enjoy first person novels, but also like 3rd person because of the different perspective. Thanks for the second chance! It doesn’t matter which point of view for me. As long as the story is good, I’ll read it. I quite enjoy stories written in the first person. The book I’m reading just now has two people telling their side of the story, each one getting alternating chapters. I am quite enjoying it as it flits between the two storytellers. I love the first person stories but I’ll eagerly read either if its well written and hold my attention. Especially love historical novels with two time lines. First person narratives can certainly be compelling, but I think third person allows for quite a few more opportunities to inject mystery and red herrings into the plot. Time and Regret sounds intriguing! Sounds like a faschinating story. Thanks for the post. I prefer different narrative techniques depending on the purpose the author is trying to achieve. I prefer first-person narrators for their ability to convey the emotional state of of person, particularly in highly-charged situations. But for works where it is more important to see how events unfold over time, I like the way a third-person account can get to the heart of the matter in a more rational fashion. A third-person narrator is often able to speculate and comment on the motivations of people with greater insight than even those involved are able to themselves. The novel sounds great. My last two were written in first person. I’m going to experiment with third person for the next I think. I prefer to read third person naratives in stories. But I will read other types of naratives as well. I just love reading.